Plastic pipes increasingly replace pipelines made of aluminum, concrete, cast iron, copper or steel: Due to their low weight and resistance against corrosion and chemicals, the volume of the plastic pipes market grows almost everywhere. The importance of the individual application areas varies significantly in regard to the different pipe types and materials. The most important PVC pipe applications are sewage disposal, potable water supply, and cable protection. Ceresana has already analyzed the global market for plastic pipes several times. Now, the research analysts present a PVC pipes market report for the first time. Ceresana expects the total production of polyvinyl chloride pipes manufacturers to increase by, on average, 3.7% per year until 2025. The highest growth rates of the upcoming years are likely to be registered by agriculture PVC pipes rather than by pipes in the real estate sector. Regular irrigation of agricultural crops continues to gain importance due to the consequences of the climate change. To the same extent, drainage systems become increasingly important since heavy rainfalls occur more and more often as well. In recent years, the size of the irrigated agricultural area in Western European countries developed considerably less dynamic than, for example, in China or India; Brazil and Turkey also have a great potential for comprehensive and systematic irrigation. Global demand for irrigation and drainage pipes made of PVC in the segment agriculture is likely to grow by about 5.7% per year in the years to come. The material PVC offers significant advantages for the production of sewage pipes: PVC is much lighter than concrete or metal. Thus, PVC pipes can often be installed without heavy equipment. Transportation of the pipes to the construction site and cutting them to various sizes is much easier with PVC pipes as well. The individual pipe parts can be much longer due to the weight and the stability of the material, which is why fewer fittings are required. This reduces the time required for connecting the parts enormously. Cost of the respective civil engineering project can be reduced accordingly. Another advantage is the variable shape of PVC pipes: Non-circular pipes, for example, are suitable for relining old drainage pipelines which often have non-circular shapes. A country’s demand for pipes is highly dependent on the development of the national building construction and civil engineering activities, on the situation of the construction industry, and on the investment climate in the respective sectors. Political uncertainties, decreasing public expenditure, or missing private investments can have similarly drastic effects on the construction industry and the pipe market as targeted support for single construction segments. The intensity with which investments in new underground sewage pipes, house connection pipes, pressure and riser pipes, or in the expansion of the fiber optic network and thus also in cable conduits are promoted varies considerably from country to country. Currently, the outlook for the important markets in China and Russia, for example, has brightened again. 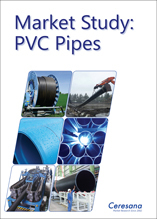 Chapter 1 provides a description and analysis of the global market for PVC pipes – including forecasts up to 2025: Revenues generated with PVC pipes and production of and demand for PVC pipes are given for each region. Chapter 2 examines the 16 major countries in more detail: Revenues, demand, production, as well as import and export are evaluated. In addition, demand for PVC pipes of each country is split by application areas. Chapter 3 deals with the application areas of PVC pipes within the individual regions and countries: data on demand development, split by the several world regions. The applications sewage, drinking water, cable protection, agriculture, industry, and other applications are examined. Chapter 4 provides company profiles of the largest manufacturers of plastic pipes – clearly arranged according to contact details, revenues, profit, product range, production sites, and profile summary. In-depth profiles of 55 producers are given, including Aliaxis Group, China Lesso Group Holdings, Fletcher Building, Georg Fischer, Mexichem, Sekisui Chemical Co, Tessenderlo Group, Uponor Corporation, and Westlake Chemical Corporation. Ceresana is a leading international market research institute specialized on the segments chemicals, plastics, industrial goods, and packaging. The company has been providing more than 10,000 customers from trade and industry in 60 countries with up-to-date analyses for over 15 years. The services of Ceresana for manufacturers, processors, and associations include customized single-client studies and more than 160 multi-client market studies.